George Graham Reviews Elizabeth and the Catapult's "Taller Children"
Chanteuse style vocalists are experiencing a revival, at least in terms of the number of such women making recordings. Artists like k.d. lang, Madeleine Peyroux, and perhaps most notably Norah Jones, have been specializing in the style, which is usually associated with romantic songs -- though Ms. Jones has also ventured into a few political songs as well. This week, he have a kind of chanteuse style pop group some of whose lyrics are clever anti-love songs -- complaining about relationships, and trying to break them off. But they do it with a lot of charm. They are the Brooklyn-based trio Elizabeth and the Catapult, whose new CD is called Taller Children. The Elizabeth in question is Elizabeth Ziman, who grew up in Greenwich Village, just down the street from famous folk clubs where Sixties folkies like Bob Dylan and Joni Mitchell got their start. In addition to being the lead vocalist, slightly reminiscent of Eddie Brickell, she is principal songwriter and arranger. She plays mainly keyboards. The rest of the Catapult are Dan Molad on drums and percussion, and some guitar and bass; and Pete Lelish, who mainly plays the guitar plus other incidental instruments. Though Ms. Ziman has one of those great voices that could work so well with the romantic material, the overall sound of the band runs more toward retro melodic pop. They embrace electric instrumentation, and occasionally turn toward a bigger production sound with a string section. But the compositions are fairly sophisticated musically, sometimes with unconventional rhythms. And as a lyricist Ms. Ziman is gives us a bunch of great turns of phrase and whimsy. In an interesting geographical twist, this New York based group recorded most of their CD in Omaha, Nebraska. They went there to work with producer Mike Magis, who has worked with such groups as Bright Eyes and Rilo Kiley. The sound is like neither one, though, and the added instrumentation is generally understated. Otherwise, parts of the CD were recorded in drummer Danny Molad's home studio. Taller Children the new CD, and the first major-label recording by Elizabeth and the Catapult is a charming and thoroughly appealing album by what I could suppose be described as a clever, witty and sometimes acid-tongued chanteuse and her band. The arrangements are quite eclectic and Elizabeth Ziman's compositions are musically interesting. With the arrangements ranging from almost solo to a large orchestra, the CD is quite diverse, but I think, always interesting and engaging. Since Taller Children was released on one of the major labels who seem to be constantly fighting a pointless and counterproductive CD loudness war, the dynamic range is pretty crummy. We'll give it a B-minus for the typical major-label ham-handed overly-compressed sound that makes everything the same loud volume all the time. Otherwise Ms. Ziman's vocals sound pleasing for much of the time, and the sonic textures in the arrangements are generally good. 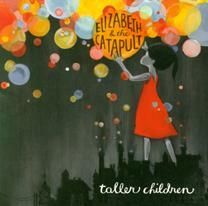 Elizabeth and the Catapult's new CD Taller Children mixes a clever singer-songwriter approach with a not-always-lyrically-romantic retro round. Add great vocals and interesting arrangements and one has a very engaging and downright charming recording. (c) Copyright 2005 George D. Graham. All rights reseved.